Kalyan Dombivali Mahanagarpalika (KDMC), Mumbai published a new job notification for Advocates Posts. The willing candidates are informed to see the latest notification March 2019. Qualification required 5 years experience in District court cases and More. Last Date of offline application is 16-03-2019. 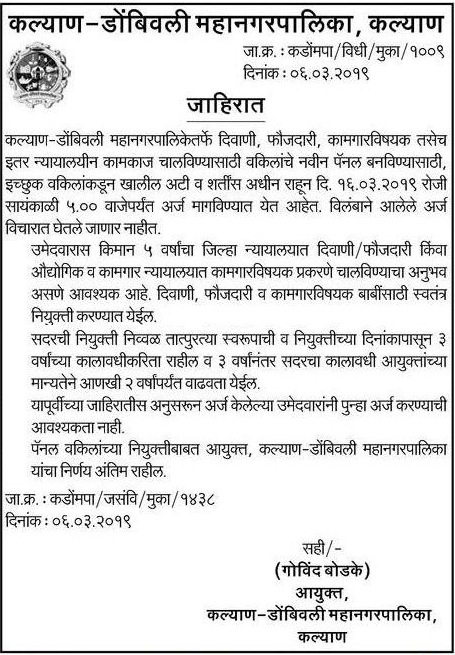 For More details of Kalyan Dombivali Mahanagarpalika Recruitment 2019 Read Below. Education Qualification: 5 years experience in District court cases and More. For Post wise Education Details follow the detailed advertisement. Interested & Eligible candidates can send their application along with all the necessary documents and testimonials to कल्याण डोंबिवली महानगरपालिका, कल्याण. Application starts offline 09-03-2019. Last Date of application is 16-03-2019.